Yesterday, my colleagues and I published a paper on Universal Principles in the Repair of Communication Problems. We also found that, on average, a problem takes about as long to repair as it did to produce, regardless of type. What this suggests is that people have a pro-social bias. In principle, any problem can be fixed with the easy-to-produce huh? So if people were being selfish, they might just produce this all the time. However, each langauge uses each type, which suggests that listeners try to help out as much as they can: speakers treat conversation as a joint activity and try to work together to fix problems. 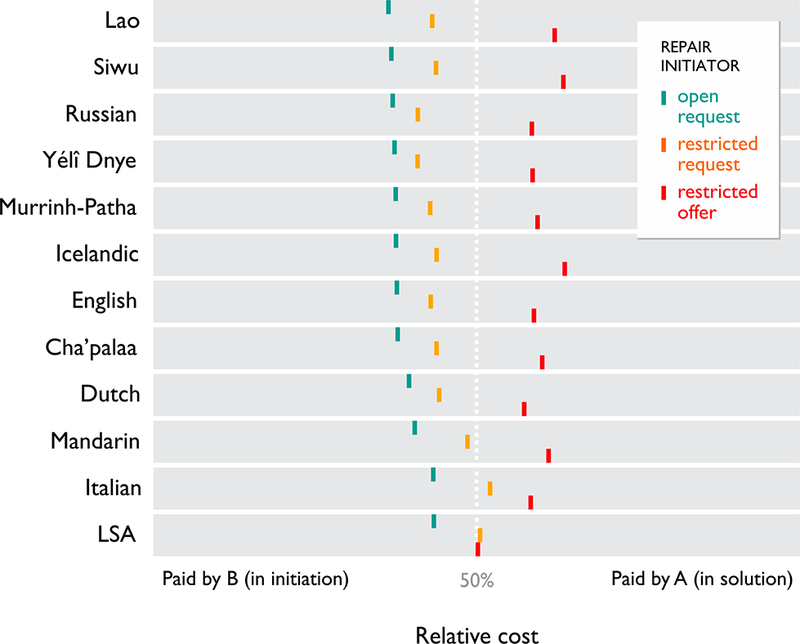 We found some variation between languages in the proportion of repair types used. However, we also found that the same factors which cause problems (e.g. noise, parallel activities) affected which tool was chosen in the same way across all languages. That is, the repair system works in the same way for all languages. This was tested using a mixed effects model which controlled for the shared history between languages. Specifically, we show that knowing what language was being spoken does not help predict what type of repair was used, over and above factors which cause problems. I’m quite proud of this mix of qualitative coding, quantitative measures and statistical methods. With 12 authors from 6 institutions, it’s also a great example of collaborative science. 12 languages may not seem like much compared to typological studies of language structure, but it has to be kept in mind that the instances come from recordings of ordinary conversations which are then transcribed, translated and coded (48 hours of video in total!). The languages are also far from a convenience sample, ranging from Yeli Dyne in Papua to Argentine Sign Language. As far as we know, no other species has this kind of sophisticated set of tools for solving communication problems. In fact, even basic repair seems to be unique to humans. We suggest, then, that this system of repair is a universal principle of human communication which emerges from a need to be understood in a noisy world. You can read the paper here, and some more details on the ideophone blog. This is wonderful stuff, Sean. No, i’ve not read the article, but I’m excited about the fact that the work has been done (started?). Somewhere around 10 or 14 years ago reading William Croft convinced me that meaning was negotiated through interaction. You’ve got evidence on at least the formal structure of how it’s done. Next Next post: EvoLang deadline tomorrow!